The cruelty here? That I ran out of these cakes... They were a pleasure to eat. If any of you were reading last week (and live in Nova Scotia) you have a couple of bags of frozen shrimp hanging around. They were on sale at the SuperStore for half price. These delicious cakes are a great – and uncommon – way to enjoy shrimp. They do take a little planning (1/2 hour chilling) but other than that are a breeze. Whoever invented the food processor should get a medal. I suppose, they probably got millions of dollars. I’d take that over a medal any day. Wouldn’t you? Regardless… these “fish” cakes are absolutely amazing. I have made cakes from crab and fresh haddock in the past and these babies beat them hands down. 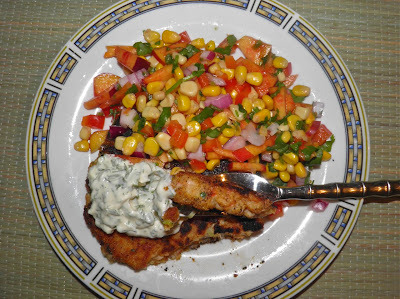 It’s probably a little hard to wrap one’s head around a shrimp cake that has quite a lot of nectarine in it, but it works amazingly well. Many fish cake recipes call for a little sugar. I just removed that ingredient and substituted real fruit. It was a really good choice. One word of caution before I dive into directions. You really should refrigerate the mixture before forming the patties, although it’s not absolutely mandatory. Refrigerating the mixture helps it firm up and is a little easier to handle. That is something you will appreciate. They’re still a little messy though. Thank goodness the taste more than makes up for any inconvenience. 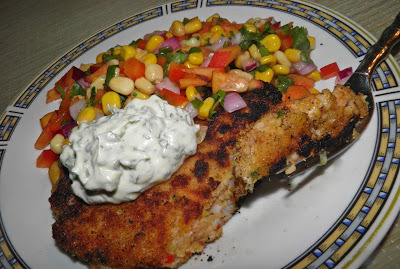 Making these reminded me of my haddock cakes (recipe here). Those put up a bit of a fight, too. Regarding bread crumbs: I used dried, but you could use fresh. Just grate stale bread and away you go. The amount of crumbs you add to the cake mixture will vary from what’s listed in the recipe, but they will be every bit as tasty – maybe better. The consistency you’re looking for is something that just barely holds together to make a patty. It will be pretty loose. Certainly not a mixture that is any stiffer. I’m sure you’ll enjoy these. I made four “significant” sized patties, but you can divide the mixture into six, or eight, or whatever you wish. 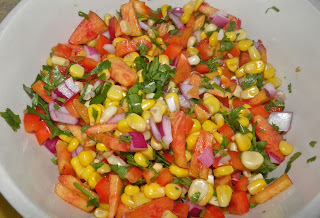 To tie everything together I served with a corn, nectarine and jalapeno salsa and a little cilantro mayo. Perfect!! Peel the shrimp. Place in a food processor and pulse about 12 times. You still want some identifiable pieces. Remove to a bowl. Slice the nectarine, bell pepper and peel the garlic. Place in the food processor and pulse until chopped into fine pieces, but not a purée. Add to the shrimp. 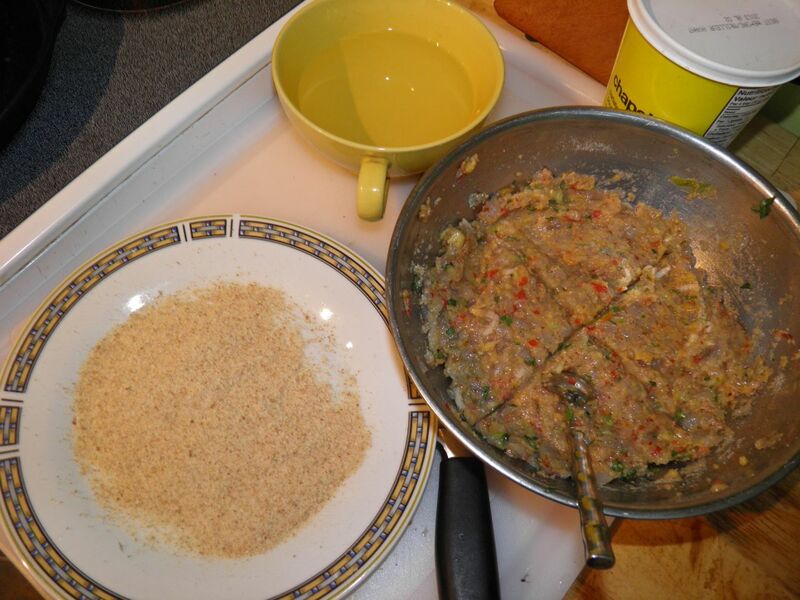 Mix all remaining ingredients – except for the vegetable oil – into the ground shrimp. The amount of bread crumbs you need will vary depending on the wetness of the mixture. Add them last. The mixture needs to be stiff enough to be made into patties. It will set up more when chilled. Refrigerate the mixture for 30 minutes. Divide into quarters. Shape each into a patty about 4”-5” wide, coat with more bread crumbs and fry about 4-5 minutes per side, until browned on both sides. You may find it easier if you wet your hands before shaping the patties. The patties will be very delicate so take care that they do not break. 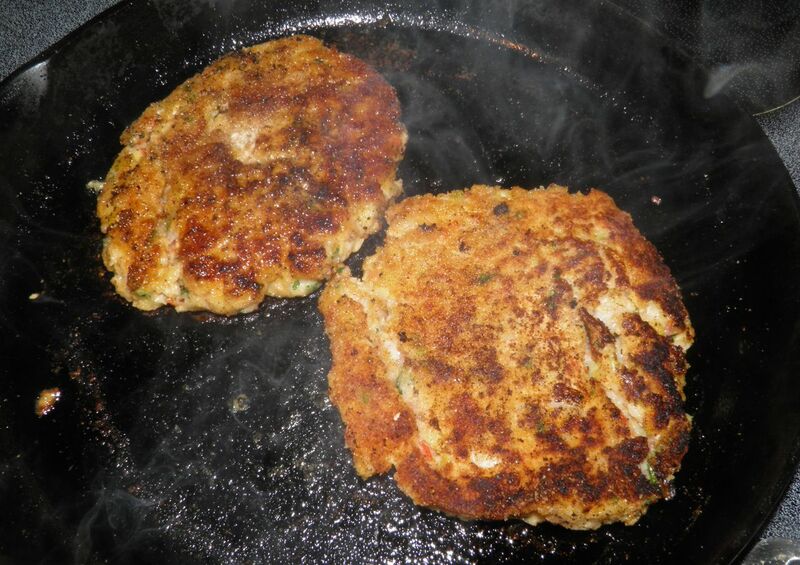 Place on a plate while you finish shaping and breading the remaining patties.Then pan fry in a little hot oil. Once one side is cooked they will hold together much better. Prepare all the ingredients as listed. Mix together and let sit for at least 1/2 hour. Simply mix both ingredients together in a bowl and serve.